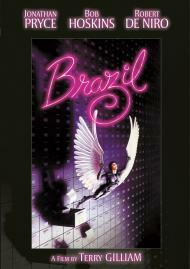 Brazil is one of those movies that people love or hate, get or don't get. It is a movie that people feel very strongly about one way or the other. The plot, vaguely reminiscent of Orwell's 1984, centers on Sam Lawry, a small cog working at the Ministry of Information. A man whose only goal in life is to remain below the radar of an oppressive government so that he can pursue the fantasy life he finds in his dreams, a goal that goes terribly wrong when his dreams and reality collide. The movie features some strong acting performances, including a small role by Robert De Niro, but there is no question that it is the visual imagery that is the true star of this film. 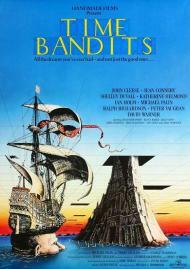 The director, Terry Gilliam, packs more visual images into some scenes then other director's put in their entire movies. So many images in fact, that it is only with repeated viewings that some become noticeable. One brief scene shows Sam returning from work on a train. You may not notice the first time you watch it that all the seats are taken by men and the only passenger forced to stand is a woman, a pregnant woman, a one-legged pregnant woman. 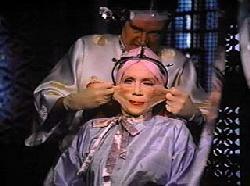 Gilliam has taken care to reward the observant viewer. Like so many of his films, to truly enjoy it, you can not sit passively as it plays, but must take an active part to feel it's full impact. Although it wasn't a wildly successful film upon it's initial release, partly due to the fact that the movie doesn't fall into any clear genre, it has since developed a cult following. An intelligent, thought provoking, visually stunning film, which provides not only tense drama, but also many, laugh out loud scenes, I would recommend this film to any serious movie fan. Jonathan Pryce soars in his dreams in Brazil. This is a stunning film to watch. The visuals all come quick and subtle. 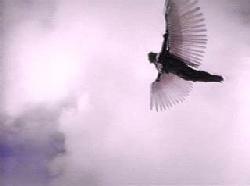 The dream sequence special effects are as good as any Xena episode. 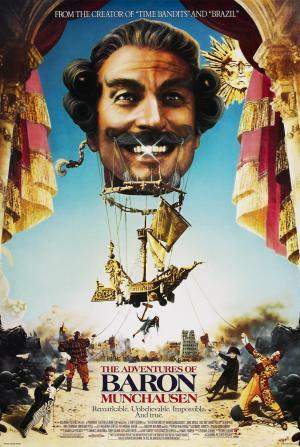 The plot is a bit Pythonesque thanks to Terry Gilliam, the director, and Michael Palin in a supporting role. Only this is darker than anything they ever did as a group. It's George Orwell's 1984 with a cynical sense of humor. I had a difficult time laughing at some of the funny parts when they were book ended with scenes of violent death or sadness. When he gets stuck going to tell Mrs. Buttle about what happen to her husband we watch a scene out of some depressing melodrama. The movie goes to two different extremes and the tone of the film gets darker and darker as it goes along. Brazil works overtime at trying to make the point that big government is bad. Everywhere there is a form or a receipt for everything. Robert DeNiro in a small part is even smothered literally in paperwork. In a final scene a government building is blown up sending papers flying. Most comedies I come away with a smile, but with this movie I was just glad it was over so I no longer had to try to figure out what was a dream and what was real. Jim Broadbent and Katherine Helmond in Brazil. On the one hand Brazil is a disturbing movie full of dread and despair. A chilling picture of one possible world in which Terry Gilliam's characters are caught in the bowels of technology complete with ducts as guts. On the other hand, this movie is an old-fashioned comedic farce complete with sight gags and slapstick. Besides owing a debt to Orwell this film is also clearly influenced by Chaplin's Modern Times. I laughed out loud during several scenes; when the waiter tells Lawry that he must say the number of the meal he has ordered and the singing telegram girl to name two. Unfortunately the humorous side of the film really suffers during the final thirty minutes marring what is otherwise a clever and well-crafted movie.